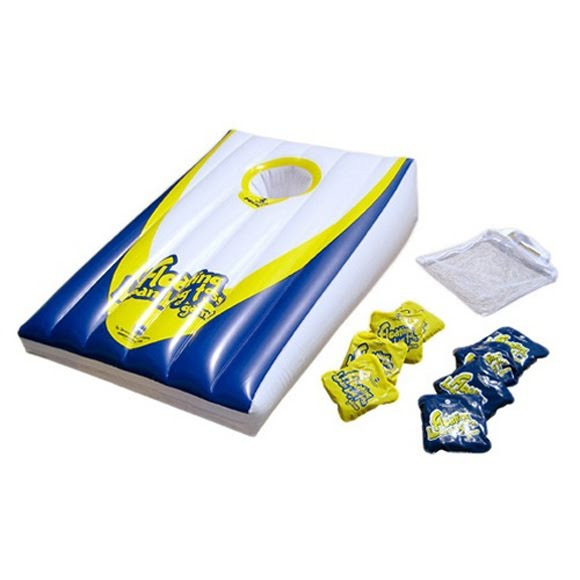 The Driveway Games Floating Bean Bag Toss Game, like Toad Toss'n, brings the fun and excitement of traditional bean bags to the swimming pool. You haven't proven your bean bag toss skills until you've competed on the water! A totally new and fun water experience for young and old alike. The Driveway Games Floating Bean Bag Toss Game, like Toad Toss&apos;n, brings the fun and excitement of traditional bean bags to the swimming pool. You haven&apos;t proven your bean bag toss skills until you&apos;ve competed on the water! A totally new and fun water experience for young and old alike. Players toss the floating, waterproof bean bags at the target, scoring 1 point for landing on, and 3 points for getting it in the hole. Scoring can also be awarded with varying points for bags landing in the different color zones. Just as much fun on land too!